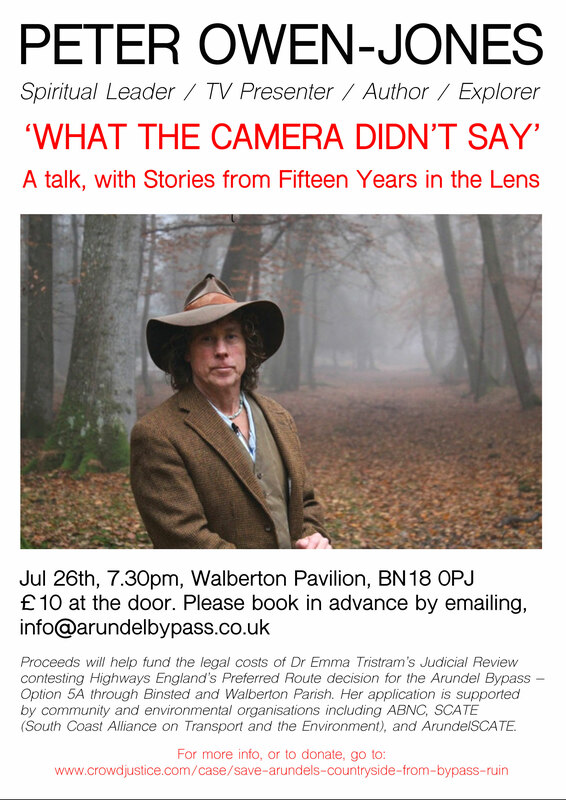 On Thursday 26th July 7.30 there is a talk by Peter Owen-Jones in Walberton Pavilion BN18 0PJ, "What the Camera didn't Say", £10 at the door, tickets can be booked on info@arundelbypass.co.uk . Britain’s newest National Park, the South Downs, took centre stage in a BBC documentary, South Downs, presented by Peter in 2017. The programme follows him on a personal journey into heart of the National Park. From the Seven Sisters Cliffs to Winchester, he experiences an extraordinary year following the wildlife and the people who live and work in what was described by William Blake as ‘England’s mountains green’. In early 1996 he gained notoriety when he conducted a service for the Newbury bypass protestors. In 1998, he was responsible for three parishes in Cambridgeshire as the rector of Haslingfield (Harlton, Great Eversden and Little Eversden), before resigning from this position in 2005 to relocate to the benefice of Glynde, West Firle and Beddingham. He was recruited by the BBC to front a series of television programmes looking at different aspects of faith. In his BBC documentary How to Live a Simple Life (2009), Owen-Jones tried to live a life without money in the footsteps of Saint Francis of Assisi. His 2006 documentary, The Lost Gospels, discussed the Apocryphal Gospels which were omitted from the canon of the New Testament. He considered how their contents might have altered Christian theology if they had not been suppressed. Proceeds will help fund the legal costs of Dr Emma Tristram's Judicial Review contesting Highways England's Preferred Route for the Arundel Bypass - Option 5A through Binsted and Walberton Parish, Tortington and the beautiful Arun Valley watermeadows.